BAZIC 9 ml Metal Tip Correction Pen (2/Pack). Dries Quickly. 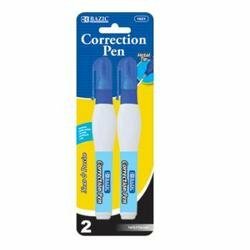 It provides neat corrections with no messy brushes or spilled bottles. Ideal for correcting letters and numbers. Warning: Intentional misuse by deliberately concentrating and inhaling the contents can be harmful or fatal fammable. Keep out reach of children. Improved barrel design, for more controlled flow. Contents of 9 ml (0.31 fl oz.) each. View More In Correction Pens.